In IntoSport's Golf section, you'll find memorabilia, classic photos, personalised gifts, collectables and much more. 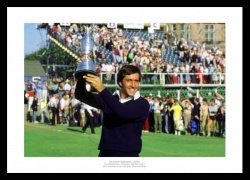 So whether you are a Golf fan or you are looking for Golf gift ideas or presents, then IntoSport has a wide range of top quality memorabilia and gifts for everyone. The golf legend's greatest victory. Great moments in Open Golf history through newspaper reports. You win the Open at St Andrews! The history of the Ryder Cup through newspaper reports.